In honor of National Better Breakfast Month, I wanted to revisit some of the top breakfast choices that I have blogged about before. Breakfast is important to me, and I really don’t feel right if I leave home without having something healthy and filling to get me through the morning. Eating breakfast also keeps you from being tempted by those high calorie, fat-laden, preservative-filled snacks throughout the day. Let’s look back at some healthy “better” breakfasts that will leave you feeling full – and good about yourself. Low calorie pancakes. Pancakes are notoriously unhealthy when it comes to breakfast options, but I have modified a classic buttermilk pancake recipe so that I can indulge in this delicious breakfast without feeling guilty. I make these using whole wheat flour and they are so yummy. Be sure to top them off with Promise Light Buttery Spread. Low-calorie crumpets. I love crumpets. Heck, I love bread in general. I posted awhile back about low-cal crumpets as an excellent breakfast food. I buy my crumpets from Baker’s Delight, and they are fat free with only sixty little calories. A bit of olive oil drizzled across the top makes them delicious and fast for a quick breakfast. Or, some low calorie peanut butter - PB2. Egg Beaters. You may recall that I love eggs. And while I eat my fair share of traditional eggs from time to time, Egg Beaters is a wonderful way to get my egg “fix” with fewer calories. Egg Beaters are cartons of uncooked egg whites that are already beat up (hence, the name Egg Beaters) and ready for you to use. I use them for a nice omelet with a bit of fat free jalapeno jack cheese and some low fat sour cream. Yum! Fage Yogurt. 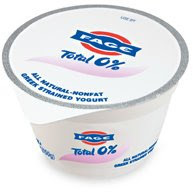 Sometime back I posted about non-fat Fage Yogurt. This is some decadent stuff. I prefer the Total 0% variety, which is just eighty calories, but it also comes in a 2% variety. This is a quick breakfast that you can also take with you in your lunch box. Think about adding your favorite things to plain yogurt – like honey, berries, frozen bananas, cinnamon, low-cal crushed cookies and more. Be creative! Steel cut oatmeal. If you’ve been following this blog for quite some time, you may recall my posting on steel cut oatmeal. I recommend the premade frozen version – Amy’s Organic Bowls or Trader Joe's version. 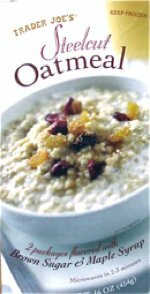 Oatmeal is a traditional breakfast choice and steel-cut oatmeal in particular is filling and delicious. Top your oatmeal off with a handful of berries for an extra boost of energy and sweetness. I hope you enjoy some great breakfasts this month and for many months to come! And, if you are looking for more breakfast ideas check out my other postings on low calorie breakfasts, which include tons of great low calorie cereals, low calorie smoothie recipes, and beyond..
Good advice except for the Promise Spread. Reducing calories by recommending trans fat laden spreads is poor advice. It may say "0 grams trans fat" but that's because the government doesn't force reporting if the serving size is less than one gram. If it says hydrogenated oil in the ingredients then it's trans fat! Try fat-free "butter" sprays without hydrogenated oils as a better alternative. I also suggest buying steel cut oats in bulk. To prepare, if time is an issue, place them I'm a slow cooker the night before with the recommended water, set on low and the next morning, voila! There isn't anything hydrogenated in promise so it should be 100% trans fat free. Way to many carbohydrates! Also Promise spread has trans days even though the lake said zero. Read the ingredient last and you will see the word hydrogenated, use smart balance instead. And greek style yogurt has twice the protein which is going to leave you fuller longer. And the suggestion to mix honey in? Come on, anything good on honey in offset by ask the sugar your taking in from the honey. You might as well hook a five pound bag of dominos up in an IV. This breakfast needs a lot more low fat protein. You are corrrct about the promise activ product, but the article says promise light buttery spread not promise activ.